When it comes to power tools, Dewalt has come to be known as one of the names that can be trusted on. Therefore, when this company comes out with a new tool, people take it seriously. The DEWALT DCD771C2 is one of them. The compactness of the drill underlines its lightweight design. In spite of its comfortable compactness, the drill contains a high-performance motor that is capable of delivering 300 watts. There are, in fact, quite a few interesting features that you will be seeing in this DEWALT DCD771C2 review. In order to get the best performance out of a drill, the motor must be powerful. The DCD771C2 accomplishes this beautifully. Its motor is capable of producing more than 300 watts. As a result, the drill/driver has the ability to accomplish a wide range of driving and drilling applications. Users will be able to complete various tasks with much ease with this tool. This tool consists with a ratcheting chuck of the single sleeve variety. Its size is only 1/2 inch. As a result, the bit gripping strength is quite tight. In other words, the drill bit will not fall off as the drill mode is being used. It will also remain in place even if the tool is not being used. Another amazing feature of the DCD771C2 is the high speed transmission that allows it to have 2 different speed settings. The first setting has a speed of 0 RPM to 450 RPM while the second is much faster at 0 RPM to 1,500 RPM. The multiple speed settings allow the tool to be used in a variety of drilling and fastening tasks. The range is wide enough to accomplish all projects, big and small, that can arise at home. Using a powerful tool perfectly is difficult. As such the presence of an ergonomic handle can be a major comfort and benefit when working on long projects. Moreover, users will also be able to exert greater control over the tool during its operation. The risks of the hand slipping off the handle has been minimized as well. The Dewalt 20V cordless drill has been equipped with a LED light. This light has been implemented just above the trigger. It can be activated when working so as to illuminate the dark sections during work. There will always be enough light so that the driving and the drilling work can be completed according to perfection irrespective of the availability of external lights. According to the DEWALT DCD771C2 review, this is one of the best features of the tool. The compactness allows it to fit perfectly into tight areas during use. Additionally, the weight of the tool is only 3.6 pounds. Therefore, carrying around is an effortless task. Moreover, the lightweight nature of the tool allows it to be used for longer periods of time without being uncomfortable. Although the drill feels light, the fact is that it has been made of high quality steel. As a result, it makes the Dewalt 20V cordless drill rather durable compared to the other similar tools in the market. There are certain parts that have been crafted from hard plastic such as the handle. This increases the sturdiness of the sections allowing the overall tool to be strong enough to last for a long time. Another interesting feature of the DCD771C2 is that it is a cordless drill. In order to use it, a 20 volt lithium ion battery has been provided. This battery has enough capacity to allow the drill to be operated for quite a good period of time. At the same time, DeWalt has ensured that users never run out of power by providing two of these batteries with each DCD771C2. The DEWALT DCD771C2 review states that the dimensions of the tool is 13.9 inches x 9.9 inches x 4.2 inches. As a result, the tool is small enough to access smaller sections when driving or drilling. Moreover, the small and compact size allows the tool to be carried and stored in a very easy manner. This drill/driver has been given an excellent warranty package by Dewalt. It includes a limited warranty that is valid for 3 years along with a free service contract for up to 1 year. There is also a money back guarantee that is valid for the first 90 days. Compared to the other similar tools in the market, this is one of the best warranties available. With such generous terms, Dewalt certainly makes a favorable statement about the quality of its products. Finally, the DEWALT DCD771C2 comes with a carrying bag meant to be used by the operator. The bag is not only capable of holding the drill but also the 2 batteries and the charger. The bag is small enough to be stored easily. Moreover, it is easy to keep the tool and the accessories in this bag. However, it cannot be used for storing any other tools. This may be a problem for some users. The fact is that the DCD771C2 is good enough to be used in various kinds of projects. Be that as it may, it is certain to benefit especially those who work on DIY projects at home. After all, this is a professional grade tool although it can be used with little effort. The affordability is another reason why amateurs can opt for this tool. 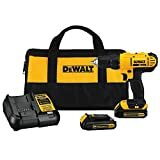 At the same time, it can also be chosen by professionals who require a drill/driver kit that is powerful but affordable. Its features make it one of the best options at its price level and niche. This tool can serve some excellent uses as a drill as well as a driver. Therefore, it is most defiantly worth the purchase.